Dooney and Bourke accessories have casual, timeless style and easy care durability that make them perfect for everyday use. This wallet is no exception! 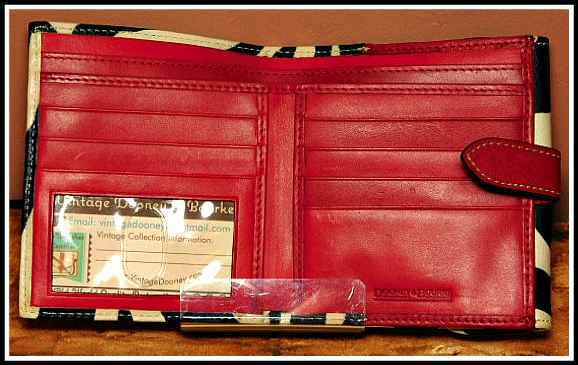 Toss your Dooney Accessory into your handbag during the day, then slide it into your clutch or pocket for a night out. 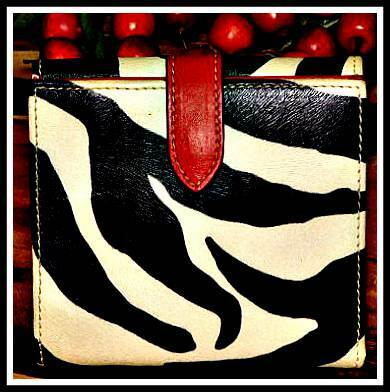 Size: H 4.75" by L 4.75" by W 1"
Jo's Note: “A Zebra credit card wallet with red interior! Stunning! A deluxe Dooney and Bourke with a place for everything. Great condition and fab bargain." Ask Questions before purchasing as I want you to be thrilled with your purchase! 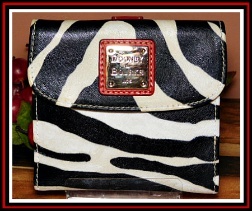 email me at vintagedooney@hotmail.com with questions. Note: I am required to say that I am not an employee of Dooney & Bourke and, to the best of my knowledge; each item I have listed on my site as such is a 100% authentic Dooney & Bourke Handbag. If I cannot verify the authenticity of an item, I will say so. All items except Bargain Bags come with a money back guarantee according to our return policy. All items we list are guaranteed 100% authentic or your money back.